Fans of Star Trek, particularly those who can read or understand the Klingon language will know that nga’chuq rites are the mating rituals of the Klingon species. These rituals are physically demanding resulting in blood being shed and often bones being broken. In fact the breaking of a collar-bone on the wedding night is an extremely auspicious sign for the wedded union. 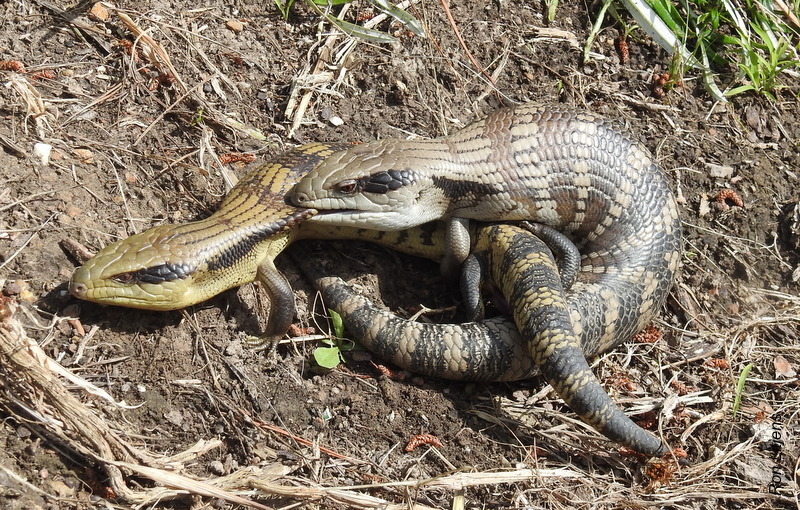 A cry of ‘snake in the garden’ from my ‘urban’ sister resulted in several people running to observe, instead of a snake, two Eastern Blue-tongue Lizards (Tiliqua scincoides) mating. 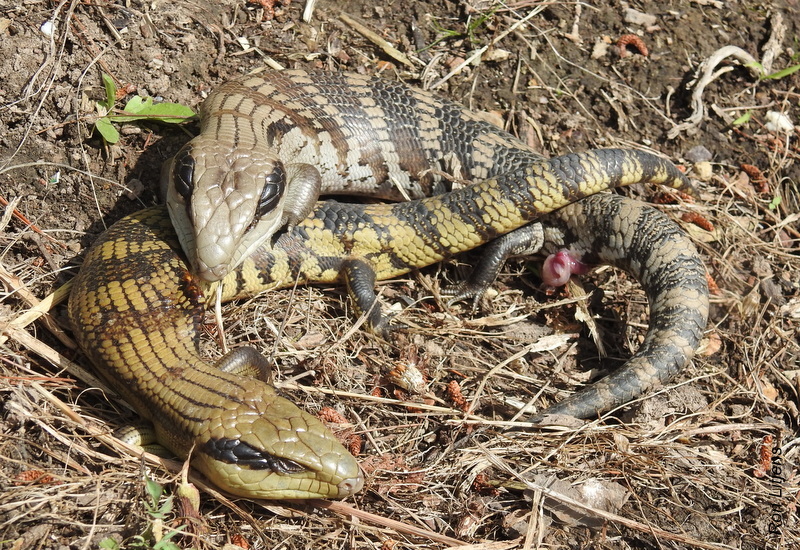 Blue-tongue Lizards are the largest members of the Skink family. Eastern (otherwise known as Common or Northern) Blue-tongues are distinguished from their closely related cousins, the Southern Blue-tongues, in that they have striped rather than blotched markings. Eastern Blue-tongues mate between September and November and give birth to three to five live offspring between December and April. In the garden the male lizard had grasped the female firmly on the back with its teeth as the latter tried to escape (see picture above top). After several minutes of gyrations the female escaped with a gaping back wound. Last seen the female lizard was heading into the bush being hotly pursued by its mate (with genitalia clearly on display), pictured above. Although no bones were broken the incident looked very Klingon-esque. you have excelled yourself Ron! what photography and description!